Biden's Comment On China's One-Child Policy Spurs Anti-Abortion Ire : It's All Politics While in China, Vice President Biden inadvertently stepped into the U.S. culture wars with a seemingly off-hand comment about China's one-child policy that has caused American abortion opponents to rebuke him. 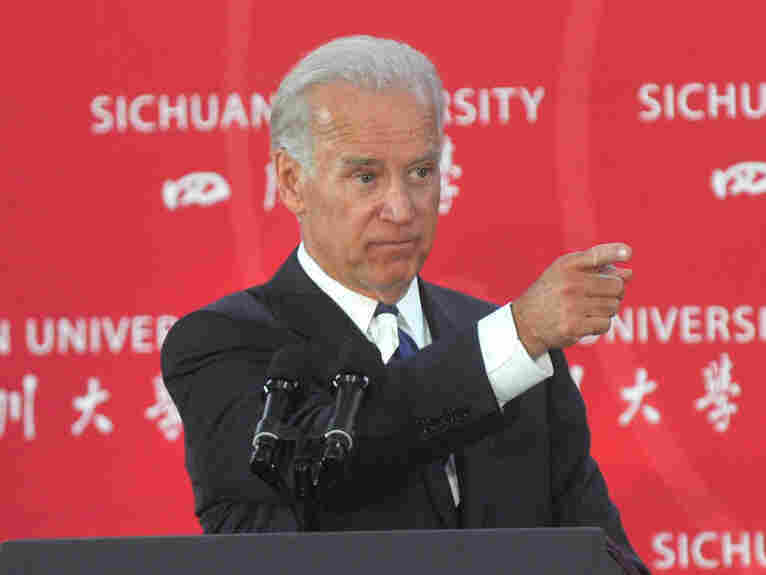 Vice President Biden at Sichuan University in Chengdu, China, August 21, 2011. While in China, Vice President Biden inadvertently stepped into the U.S. culture wars with a seemingly off-hand comment about China's one-child policy that has caused American abortion opponents to rebuke him. In the question and answer session following his speech to an audience at Sichuan University Sunday, Biden was asked what the U.S. planned to do to fix its fiscal problems to reassure Chinese holders of U.S. debt. Fair enough considering the Chinese hold $1 trillion in U.S. debt. Biden explained that U.S. policymakers had already agreed to make more that $1 trillion in cuts. He even got down into the weeds and alluded to the congressional supercommittee. But as I was talking to some of your leaders, you share a similar concern here in China. You have no safety net. Your policy has been one which I fully understand — I'm not second-guessing — of one child per family. The result being that you're in a position where one wage earner will be taking care of four retired people. Not sustainable. Those who want to give Biden the benefit of the doubt will see this comment, culturally relativistic as it sounds, as his way of doing nothing that would add to the tensions in U.S.-Chinese relations. After a week in which Chinese and U.S. officials got into a shoving match at the Great Hall of the People and American and Chinese athletes got into an actual brawl, the vice president's solicitude, if not choice of words, makes a certain amount of sense. But not everyone wanted to give Biden the benefit of the doubt. China's one-child policy is gruesome and barbaric. Vice President Biden's acquiescence to such a policy should shock the conscience of every American. Instead of condoning the policy, Vice President Biden should have condemned it in the strongest possible terms. There can be no defense of a government that engages in compulsory sterilization and forced abortions in the name of population control." "Vice President Biden's approval of China's one-child policy, which uses forced abortion to enforce the law, crosses the lines of ignorant and wrong. Then to suggest that the United States should learn from China's policy, like forcing its citizens to have only one child, to help manage debt, is an insult to the basic American values of life and liberty. Government spending, not the lives of innocent children, should be cut off in order to control our nation's debt. To suggest otherwise is nothing short of an idiotic statement. Also, Concerned Women for America would like to know if Biden's position is the official Administration's stance on the barbaric and brutal one-child policy in China."